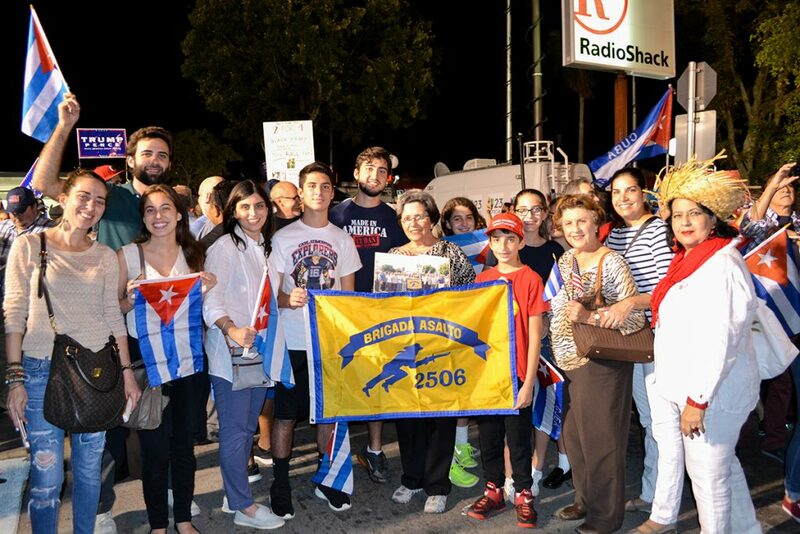 Hundreds of Cuban exiles gathered in Little Havana to celebrate the death of dictator Fidel Castro and protest against the island nation’s Communist government. City of Miami Police estimate 1,400 people attended the planned event, which began at 5 p.m. and shut down five blocks of Calle Ocho. Most of the activity was centered near the Bay of Pigs Memorial on 13th avenue, where a stage, lighting and speakers were set up. People danced in the streets, waved Cuban and American flags, held newspapers with headlines announcing Castro’s death and carried signs saying “Fidel Castro, roast in hell,” and “Free Cuba.” Demonstrators pushed a skeleton dressed as Castro in a wheelchair, and one woman adorned in Christmas lights held a sign asking Santa to bring democracy to Cuba. A heavy police presence was visible, and one City of Miami Police officer said the agency had assigned about 50 uniformed and undercover officers to the event. Earlier in the evening, speakers took to the stage, urging Cubans to fight against the nation’s Communist government. Many at the event also carried Donald Trump signs or wore “Make America Great Again” hats, optimistic that the president-elect will improve relations with Cuba. While a majority of those who attended the rally were of Cuban heritage, others like Nicaraguan Silvio Morraz attended as a sign of solidarity.